Ok, here's another evidence of lack of research. I have no idea what this garment is technically called, so I've been calling it a coat, I'm pretty sure thats not right. Anyone care to enlighten me? 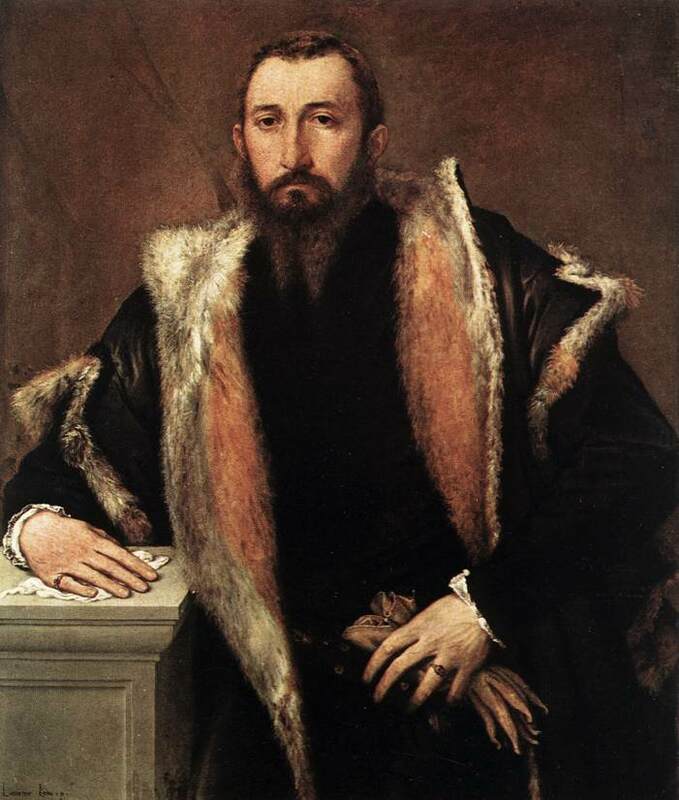 I saw this type of garment in two pictures, several decades apart and both appear to have almost the exact same construction, the first is Lorenzo Lotto's 'Portrait of Febo da Brescia' in 1544 and the other is in Giovanni Battitsta Moroni's 1565 'Portrait of Antonio Navagero. Anyway, I wanted to make this coat for my dad to wear to the wedding. 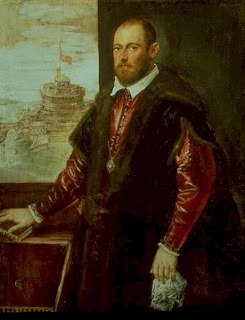 He is down in New Mexico until the day of teh rehearsal, and so that gives no time for fittings and no way to get his measurements, and the coat is loose fitting and should easily go over a (not so well fitting) borrowed doublet. However...not that I have it done, and it went so easy and looks so nice, I may have milord wear it over his doublet instead and make another one for my father. We'll see;-) I'm just crazy. And miraculously the coat is both long enough and plenty full enough. I was very worried at first. The front of course I slit open down the center front and I cut down a bit more of the neck opening in front. I trimmed the edges of the first rabbit hide, and then cut in half widthwise and stitched the two pieces together side by side for the collar lining. The rest of the garment is lined in plain black cotton. The remainder of the rabbit hides I trimmed down to nine inch strips, and then cut those again lengthwise and placed the narrow edges together and sewed those down to only the black cotton along the front opening edges. For the fur edging around the sleeves I used the long kinda ragged strips from the edges of the rabbit hides and placed those along the outer edge of the black cotton lining for the sleeves and stitched those down. Then I sewed the garment as usual, bag lining it, and topstitching the edges. This was perhaps not the proper way to sew with fur, but i'm very new to working with fur and this was simple and effective. I lengthened the stitch on my machine to avoid perforating the thin rabbit hides too badly and so far there is no tearing:-) We shall see what happens after it has been vigorously worn a few times, and hopefully someday I'll get to make one with a better fur than rabbit.